It’s a sentiment that has been going through my mind a lot these past few years when it comes to the United States of America. My problem is that I *do* recognize it, and I know that I can’t save it. Or, at least I cannot save it by myself. In fact, I don’t think anyone can at this point. This is the America of my worst fears. This is an America that is ruled by a narcissist, administered by kleptocrats, legislated by sociopaths, sponsored by corporatists, adjudicated by rubber-stamping myrmidons, fueled by hyper-partisan propagandists, and supported by willfully-ignorant cultists who have deluded themselves into believing that what they are doing is in the name of “freedom” and “liberty”. A leader who boasts in ever-increasing exaggeration of winning what he literally said was a “rigged system” and then denies any connection to it. A first-world cabal that behaves like a third-world junta. A gang of thugs that makes the rules up as they go along, and then changes said rules so they will always prevail. That condemns facts and reason, condemns intelligence, and condemns any truth that paint them in a bad light as “fake news”. That demands absolute worship under the perverted banner of “patriotism”. Let’s get brutally honest here... this is not a free nation. We have forfeited any pretense of being one. We are a perversion of what we pretend to be. We are detaining people at the border without trial, in direct violation of our own Constitution. The freedom to speak is attacked by myrmidons who decide which speech is “permittable” based on whether or not they show fealty to the President. Even this commentator would be branded an “enemy” simply for exercising my First Amendment right to speak out. We have newspapers under verbal attack by this President and under literal attack by armed lunatics with a grudge. Protesters are arrested by the hundreds for simply protesting. And we have a judicial system that was intentionally undercut by the GOP before 2017, and now being filled with like-minded judges at a record pace. The very idea of “Checks-and-Balances” has been nullified. As a studier of history, I cannot help but see the comparisons to Europe in the 1920’s and 30’s. And I am not alone in this. Certain cable channels like the History Channel and the American Heroes Channel have been airing documentaries showing how things were in those years as an invitation to compare them to today. Even Mike Godwin, the author of one of the oldest Internet rules around – Godwin’s Law – out-and-out said that it is perfectly fine to compare what America has become to what was going on in Germany and Italy. I have, and it is valid. And it is disgusting. But we did not get to this point overnight. Nor did this transformation start with Donald Trump having desires for the presidency. He can’t even claim to be the architect of this. Our slide into despotism and fascism started decades ago, with an extreme faction promising violence and retribution if they don’t get their way. A faction that went from Oklahoma City to bombing the Olympics to killing doctors and nurses. They were bolstered by 9/11 and the idea of waging a holy war around the world. They grew support with their outright hatred of Barack Obama as President and transformed it into a political movement in the GOP. This same faction took control of a presidential election, and now they are in control of the country. Just like in Italy in the 1920’s, and Germany in the 1930’s. A violently-aggressive faction has taken control of this country and they are using the very media they claim to hate to “normalize” and indoctrinate the masses into a cult-like compliance. They dangle words like “greatness” and “strength” and “prosperity” as a lure. Just like Italy. Just like Germany. I’ll make this as clear as possible. I love America. I always have. But I love America for what it should be. Not for what it was, because for every great action, there was one of great shame that we refuse to own up to. We expanded, but at the expense of those who were living there already. We allowed slavery to prosper, and even when it ended “on paper”, we put in policies and laws that continued the policy of racial and economic superiority. We locked up Japanese, German, and Italian Americans in internment camps in the 1940’s, just like we are doing today at the border. We liberated Iraq and Afghanistan, but then we got caught torturing our own prisoners and holding people indefinitely without trials. We have been every bit as wrong as those we crossed oceans to depose. That is our legacy, whether you accept it or not, and that is not something that we should be proud of or want to return to. And I certainly do not love what America stands for today; ruled by a narcissist who praises tyrants and demands a military parade and a lifetime appointment, with a sociopathic legislative body in charge and a co-dependent political “alternative” that is so weak and spineless that they can only serve to warm the seats of the dominant sociopathic party until the next election. The America that I love and the America that I will stand for and fight for is the America that should be. The America that we all pretend it to be. The America that stands for and defends freedom for everyone, and not just for the dominant few. The America that doesn’t prosecute or persecute people for the imagined crime of doing anything “while black”. The America that doesn’t treat an act of peaceful protest as a manufactured personal affront. The America that does not mistake corporations for people or confuse Wall Street with Main Street. The America that protects religion for all by keeping the dominant and domineering faiths out of government influence. The America that promotes freedom in other countries by example instead of a pretense for propping up dictators. The America that actually lives up to the promise of “liberty and justice for all”. The America that would reject and condemn those in charge today. That is the America that I support. And we are far from being that America. Now some might think that it is a pipe dream, that we will never achieve it. Maybe so. 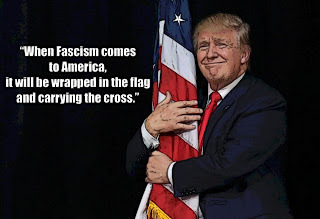 But I know that we will never make that America real if we continue to fall down the path of fascism. We’ve seen where this path leads with other nations, and it all ends horribly for the people in those nations, more so than for the ones in charge. Wise words that went unheeded seven decades ago. And words that no doubt will continue to be ignored this week as we continue to live in ignorance and delusion as we celebrate the birth of a nation that truly does not exist; one that my fellow Americans will do everything in their power to ensure that it stays just a delusional fantasy.